Stucco adds a layer of textural interest to your home, but it also provides lots of nooks and crannies for dirt, pollen, and other contaminants to collect. The best way to remove it is with a soft wash, rather than with high pressure. Stucco can be damaged if the pressure is too high, so we rely on a custom chemical solution that is plant and animal safe. When we wash stucco, we want to keep the pressure low. If we go too high, we can cause damage. That’s why we mix a custom blend of chemicals that we apply to the surface, instead of relying on water pressure. After we let the soap do its work, we rinse it away to reveal the clean and sparkling stucco underneath. Rolling Suds can handle residential and commercial jobs throughout Southeast Pennsylvania and South Jersey. Our services start out with a free estimate. To get started just fill out our quick quote form or call 215-372-8815. White vinyl siding creates a crisp, bright aesthetic, and it goes with everything! But, as time goes on, it starts to look a little less white and a little more brownish green. Thankfully, pressure washing is a good way to wipe all that gunk away. In addition to vinyl siding, pressure washing is safe for use on wood, concrete, brick, masonry, and more. Check out this siding. Before, it looked green and dirty, but after we pressure washed it, it looked as good as new. 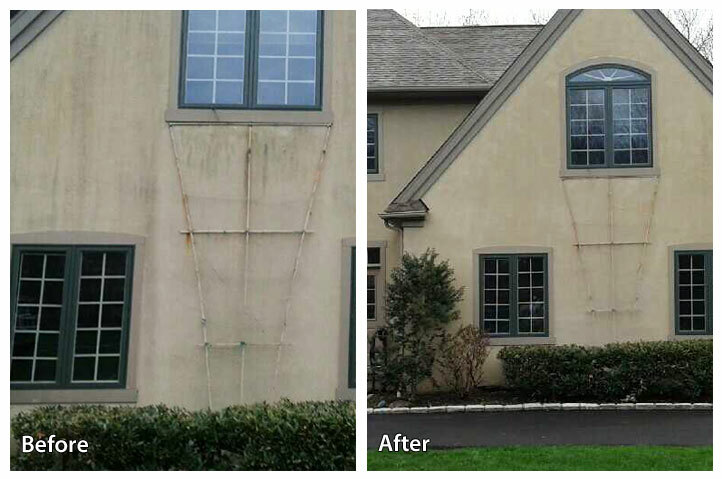 If you’re ready to get started with our pressure washing services at your home or business, contact us online or call 215-355-1631 for a free estimate. In addition to cleaning residential properties from New York to Maryland, our services are available at commercial sites. Our equipment allows us to clean even 100-foot tall buildings. We can clean tile, concrete, wood, masonry, and more. We are equipped to clean buildings as high as 100 feet, like this high-rise building in downtown Wilmington. In the video below, you can watch up close as we wipe the grime away! If you think our services may be a good fit for your home or business, fill out our quick quote form. You can also call 215-515-0778 to get your free quote. Pressure washing is a great way to clean your home. Almost any exterior surface can be safely pressure washed, including masonry, stucco, brick, vinyl, and more! Stucco tends to accumulate dirt over time. Luckily, pressure washing can easily and effectively clear away the mess. Take a look at these before and after photos to get a closer look at what we can do. 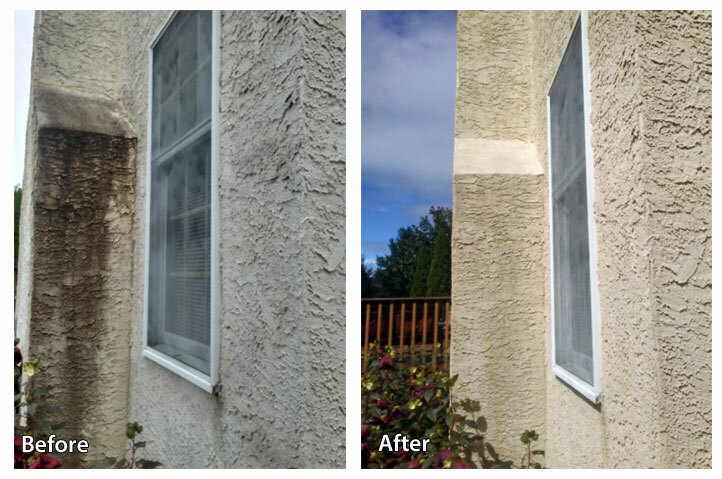 If you have a dirty stucco wall, don’t hesitate to reach out to us! We take care of stucco pressure washing at residential and commercial locations. To get your free quote, call us at 215-515-2766 or contact us online. Power washing is a safe an effective way to spruce things up at your home or business. Tile, concrete, stucco, brick, vinyl, and wood can all be pressure washed safely. The process is both environmentally friendly and cost-effective. 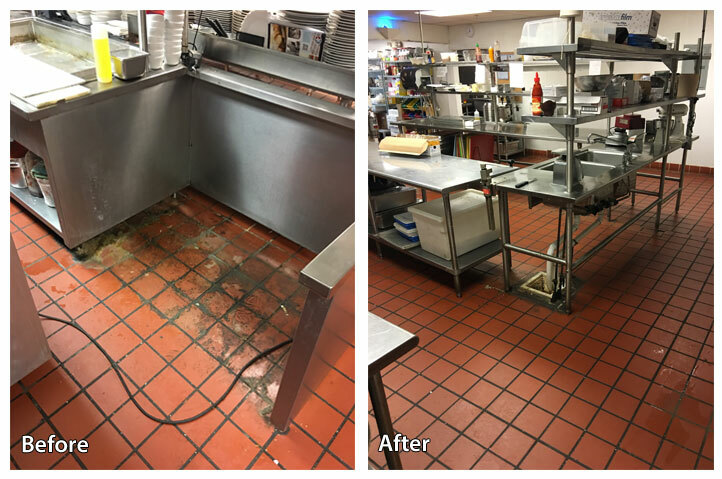 The kitchen at this country club needed a little TLC. Regular sweeping and mopping is fine most days, but every once in a blue moon, a kitchen needs a good deep cleaning. If you have a pressure washing job at your home or business, contact Rolling Suds for a free estimate! Call us at 215-515-0778 or fill our out form online. Pressure washing is a nearly one-size-fits-all solution for cleaning your home or business. Masonry, brick, vinyl siding, and concrete are just some of the applications. Plus, it’s cost-effective and environmentally friendly. We were so excited to clean this beautiful stone barricade at Rosemont College. Just one pressure wash had it looking as good as new. Get a Quick Quote Online! To get started with our services, fill out our quick quotes form. If you prefer, you can contact us by phone at 215-515-2766. Almost any exterior surface can be pressure washed. Wood, stone, stucco, concrete, and vinyl are all fair game. Whether it’s at a home or business, Rolling Suds can safely and effectively get your exterior surface clean. This building had a concrete ledge which had developed a coating of brown grime. After just one round of pressure washing, it looks as good as new! In addition to commercial buildings, our pressure washing services are also available at residential location. To get your quote, fill out our quick quotes form or call 215-515-2766. 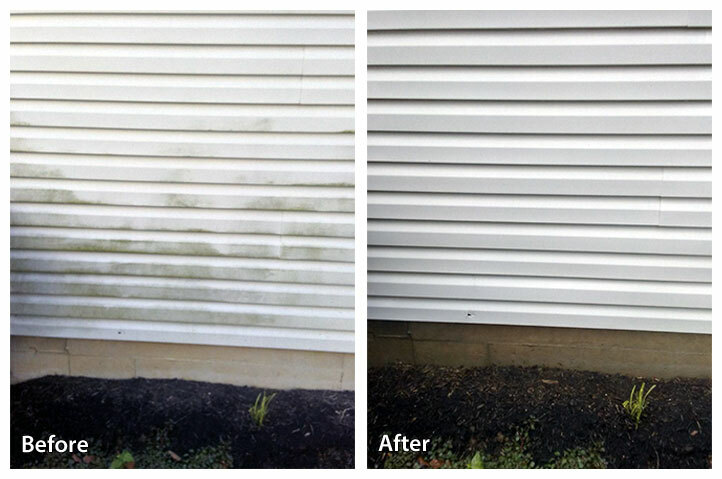 Pressure washing is a safe an effective way to clean your deck, driveway, or siding. And that’s not a complete list–pretty much any exterior surface can be pressure washed. 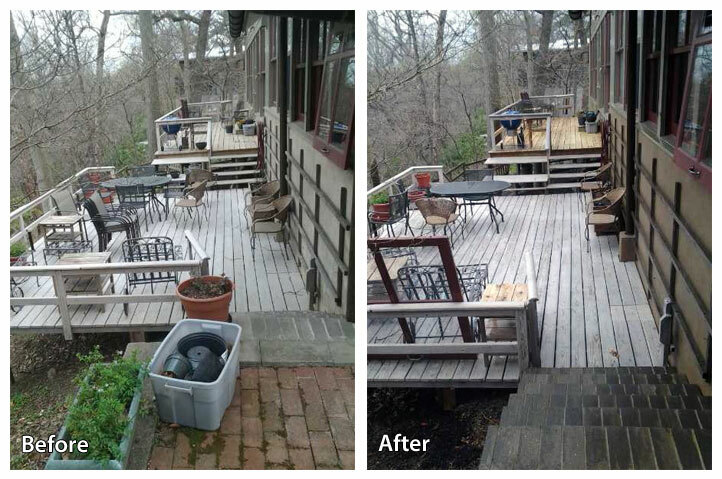 This homeowner’s multi-level deck needed some love. One pressure wash was able to get the gunk out from between their brick steps and walkway, as well as clean both levels of their deck. To use our services at your home or business, contact us for a free estimate. Get a quick quote online, or call us at 215-355-1631 for more information. There’s just no way around it. When something is outside 24/7, it’s going to get dirty. Fortunately, pressure washing is a cost-effective and environmentally fix that can be safely applied to nearly any surface. Vinyl siding? Check. Stone patio? Check. Even shingles can benefit from a gentle wash as long as you know what you’re doing. Other applicable surfaces include wood, brick, masonry, stucco, and asphalt. After many months spent in the elements, this concrete had suffered a buildup of gunk. The stucco foundation of the home also looked a little worse for wear. Pressure washing was all it took to have it looking as good as new. Rolling Suds Power Washing Professionals begins each service with a free quote. To get yours, fill out our quick quote form or give us a call at 215-355-1631. These homeowners weren’t happy with their deck’s accumulation of green residue, but we were able to wipe it clean with one pressure wash! Rolling Suds Power Washing Professionals provide pressure washing services to the Philadelphia area. Fill out our online form or call 215-355-1631 to get your free quote. Amazing all around experience. They were quick with a quote (I didn’t even have to be home), great communication, worked with my schedule, and did a wonderful job. Highly recommend! Ready to Blast Away Years of Dirt, Mold & Grime? Fill out our free estimate form and we will get back to you with information about pricing. Family owned and operated, Rolling Suds is one of the Delaware Valley's leading residential and commercial mobile power washing companies. Established in 1990, we are fully insured and use environmentally safe cleaning products. Our state of the art truck mounted power washing units - combined with our years of experience - allow us to safely and cost effeciently clean all exterior surfaces and provide the customer with complete satisfaction.